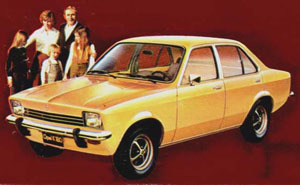 Difference between revisions of "Opel K 180"
Opel K 180 (T-car). 1974–8 (prod. n/a). 4-door sedan. F/R, 1797 cm³ (I4 OHV). Argentinian variation of Opel Kadett C, available in base, LX (1977 on) and Rally (1976 on) trims. Argentinian-developed engine (the ‘Chevrolet 110’), a four-cylinder version of the Chevrolet 194 in³ six. New engine developed 82 hp, not much of a gain from the smaller German units, and unrefined. Estate car conversion offered, few sold.